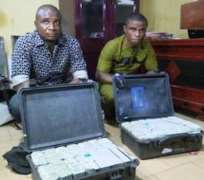 Two persons have been intercepted carrying $2.8million cash at Akanu Ibiam International Airport, Enugu. The men were arrested by the officials of the Economic and Financial Crimes Commission, Enugu Zone. The suspects, identified as Ighoh Augustine and Ezekwe Emmanuel, claimed to be workers of Bankers Warehouse. The EFCC said the two men concealed the cash in two suitcases, containing $1.4 million each. According to a statement by the commission, they were arrested at the departure lounge of the airport on Thursday night while about to board an Arik Air flight to Lagos.